The city of Chatham and the County of Kent were amalgamated in 1998 (Wikipedia). Horse car operator (Martin). Incorporated by Ontario letters patent circa mid 1885 and authorized by town bylaw 11 May 1885. Operations ceased in 1890 as a result of a lawsuit by the Town for improper pavement maintenence. Company reorganized and refinanced in June 1891. Operated by Jack Bayne. Contract cancelled February 1947. (CPTDB Wiki 2011). Operated by the Armstrong Brothers of Leamington. (CPTDB Wiki 2011). Also an intercity carrier. Initial owners Ivan DeNure and Evelyn DeNure. Later owned by their son Reg DeNure. Perera 1973 lists that the City of Chatham received transit operating subsidies from the provincial government. (RS, Canadian Coach 1971, 1974, photo: William A. Luke). Operated under contract by Chatham Coach Lines. CCL sold to Laidlaw 2000. (Sotnyk 1981, Winnipeg Transit map coll. 1987, CUTA 1992 “non-member”, CPTDB Wiki 2011, photo Luke Olszewski) (not in CUTA 1991/2, CUTA 1989 or CUTA 1988). “CK” refers to Chatham and Kent (Website 2007). Operated (2008) by contractor Aboutown Transportation Limited (website 2008). 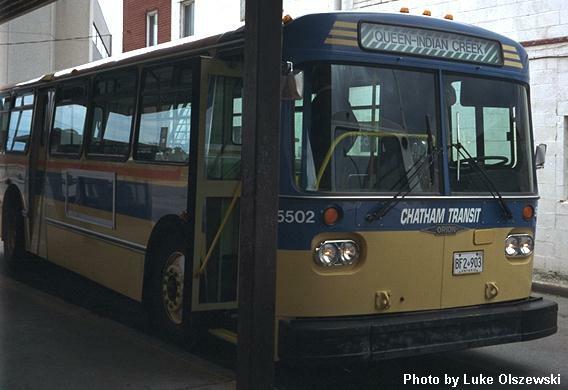 Beginning 01 October 2007 service was expanded to connect Chatham with Wallaceburg and Dresden. Second rural route from Chatham to Tilbury and Wheatley launched 08 January 2009 (website 2009). Circa October 2011 Wheatley was dropped in favour of Merlin (website 2012). Third rural route from Chatham to Blenheim and Ridgetown launched 02 January 2010 (website 2010). Interurban services are operated by contractor Chatham Radio Cabs Inc. (CPTdb 2012). From 01 December 2013 contract operator for urban and accessible transit was 947465 Ontario Limited operating as Voyageur Transportation Services. New seven-year operating contracts effective 01 July 2014 were awarded in February 2014 to Blenheim Bus Lines (owner Ken DeNure) (conventional [urban] service), and Leuschen Transportation (interurban service) ( Chatham Daily News 10 February 2014). The DeNure family organize InTouch Connection [Inc.] to assume the transit operating contract ( Chatham Daily News 02 July 2014). (photo CPTDB Wiki 2011). Nothing is known about this operation except that it issued [undated] passenger fare tokens for use at Ridgetown. The typical business pattern was common carrier scheduled omnibus service between railway station(s) and local hotels, coordinated with train arrivals and departures. Most such firms also engaged in charter activities, and some also carried mail. Tokens show three different owners over time F. Traux, M. Dougherty, and Jos. Rhody, and some tokens are inscribed Rhody & Son. ( Atwood – Coffee p. 470). 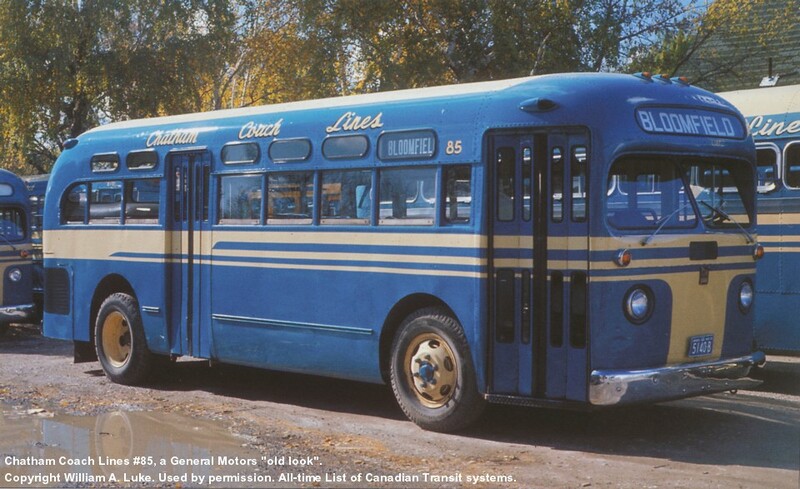 Initiated bus service between Chatham, Blenheim and Ridgetown just prior to the establishment of municipal service. (website 2011, Wallaceburg Courier Press 2009). late June 1891 - 1895? Incorporated 1903. Line from Chatham north to Wallaceburg, and branch to Paincourt, and south to Lake Erie at Erie Beach. 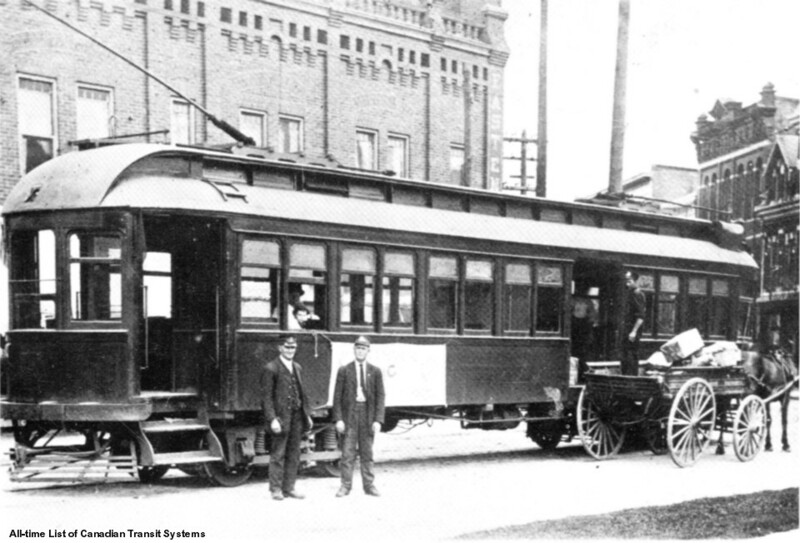 After 15 February 1913 the line was owned by the Canadian Northern Railway. Freight operation continued until 01 March 1930 (Due, RFC). “Blenheim Bus Lines: How It Began”, a world wide web page at the URL: http://blenheimbuslines.com/about-bbl/how-it-began/ 2015. Chatham Coach: History , a world wide web page at the URL: http://www.chacotrails.com/history.htm, 1998. Lauriston, Victor, Romantic Kent: The Story of a County 1626-1952 (binding title), or Romantic Kent: More Than Three Centuries of History 1626-1952 (frontspiece title), Chatham, On: County of Kent and City of Chatham, 1952, pp. 544-547. Miller, W.E., Chatham, Wallaceburg & Lake Erie Railway , a world wide web page at the URL: http://www.trainweb.org/elso/cwle.htm 1999. Rhodes, John, Come Walking and Leave Early: A Pictoral History of the Chatham Wallaceburg and Lake Erie Electric Railway Co. , Rhodes Specialty Advertising, Chatham (Ontario), 1989. Rhodes, John, “Chatham, Wallaceburg and Lake Erie”, Old Time Trains , 2013. Wyatt, David A., Notes Towards a Street Railway History of Chatham, Ontario , World Wide Web (1997) document at the URL: http://home.cc.umanitoba.ca/~wyatt/alltime/chatham-notes.html, 1997.